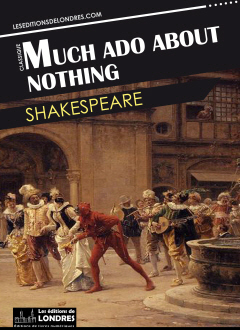 “Much ado about nothing” is a comedy written by William Shakespeare around 1598 or 1599. It is one of Shakespeare's most famous comedies. “Much ado about nothing” is the story of the developing relationship between Benedick and Beatrice, their mutual hostility, witty rivalry, and their love. The play is set in Messina. Don Pedro, Claudio, Benedick..., and soldiers arrive following a battle. Beatrice is Leonato's niece, and she does not take much time to start making fun of Benedick. From the onset the audience learns: “There is a kind of merry war betwixt Signior Benedick and her.” Leonato welcomes Don Pedro and offers for him to stay a month. Claudio feels a lot for Hero, Leonato's only daughter, and as he wants to court her, he confides to Benedick who says he is against marriage, which makes Don Pedro laugh. At a ball, a masked Don Pedro tries to gauge Hero's feelings for Claudio. Don John, Don Pedro's nasty brother, uses this opportunity to tell Claudio that Don Pedro is in reality courting Hero for himself. Claudio is furious and confronts Don Pedro. But the misunderstanding is soon over and Hero is promised to Claudio in marriage. In the meantime, Benedick and Beatrice carry on arguing, to the point that Don Pedro, Claudio and Leonato devise a plan to “match make” Benedick and Beatrice. In doing so, they mention in a conversation (which they make sure Benedick can overhear) Beatrice's love for Benedick. At the same time, Hero and her maid Ursula talk about Benedick's love for her, whilst Beatrice is hidden, listening. Benedick and Beatrice both start warming to the idea of being loved by one another. At the same time, John plots another mischief: he makes Claudio believe that Hero is having a liaison just before the wedding. Claudio is once again furious and vows to humiliate Hero. He does so in the middle of the wedding. Hero is destroyed, but the family decides to fake Hero's death in order to discover the truth. Benedick and Beatrice fall in love, but Beatrice asks Benedick to avenge poor Hero by killing Claudio in a duel. Benedick does not know what to do. Fortunately the incompetent watchmen capture Borrachio (who was a part of John's plot to dishonour Hero), and get him to confess. Leonato asks Claudio to marry his brother's daughter. When the veil is lifted, Claudio discovers that the daughter is in reality Hero, who is not dead. Benedick and Beatrice finally admit to each other that they are in love. Don John is captured. The new couples are happy and all ends well. In the 16th century, “nothing” sounded the same as “noting”, which meant rumour, gossip, overhearing. There is a pun between the two words. In northern Italian theatre of the sixteenth century, such stories of lovers lying to each other and deceiving each other were common place. The obvious character appeal of the play is the game played between the two future lovers. By portraying Beatrice as witty, aggressive, making fun of Benedick, Shakespeare defies social conventions of his times but at the same time illustrates the free spirit of the Renaissance. It's already four centuries ago, and one can say Europe was already then a modern society. Joss Whedon's 2013 cinematographic take on the play is the most recent and the freshest of all interpretations. By having 21st century looking actors talk in sixteenth century English, using a slick black and white film, he puts Shakespeare back where he belongs, not in 16th century looking theatres, not late at night on the stage, but at the center of everyday life. A life rendered more delicate, beautiful, euphoric thanks to the characters, words and situations from Shakespeare. His characters are adorable and unreal, their looks amusing and gracefully natural, their voices musical, their take on four centuries old sentences both fearless and respectful, the music of the prose when recited by them as enjoyable as their light hearted demeanour. Their lack of classical training (?) makes them more eager to own the text and turn it into something untainted by centuries of tradition; in the mouths of Benedick and Beatrice, it's as if the words are reborn. By making “Much ado about nothing” modern, without attempting to modernize the words, Whedon is more loyal to the spirit of a 16th century Shakespeare, full of life, entertaining, amusing; he manages to make Shakespeare cool again.